Jeff was born in Santa Monica, CA, and spent most of his youth as close to the beach as possible. He graduated from UC Santa Barbara with a B.A. in Cultural Anthropology and Political Science, and received his J.D. from Willamette University in Salem, Oregon. Homesick for the blue skies and oak covered hills of Southern California, upon graduation from law school he moved to San Luis Obispo in 1975. After an enlightening foray into elected politics as a member of the San Luis Obispo City Council and San Luis Obispo County Board of Supervisors (District 5), Jeff worked for the next 25 years as a municipal attorney, serving at various times as contract City Attorney for the cities of Morro Bay and Atascadero, as counsel to the Santa Maria Public Airport District, and as legal advisor to other public agencies on the Central Coast. For several years he was a lecturer in the City and Regional Planning Department at Cal Poly on planning and environmental law. In 1989 he became City Attorney for the City of San Luis Obispo, and served in that capacity until his retirement in 2003. Perhaps his proudest accomplishment was to write the first comprehensive ban on smoking in public places in the United States. He was also closely involved in the development and implementation of the City’s open space program. Jeff has served on numerous local boards and commissions over the years, including the Human Relations Commission, the American Lung Association, the Mozart Festival, United Way, S.L.O. Chamber of Commerce, S.L.O. County Bar Association, Hotline, and the S.L.O. County Archeological Society. 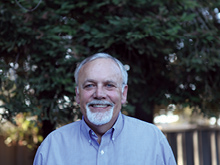 For more than forty years Jeff has pursued his love of nature through cross-country backpacking, having explored many of the most remote corners of the Sierra Nevada, Big Sur, and the Los Padres and San Rafael Wilderness Areas. Since retirement, he has also returned to his lifelong interest in anthropology, attending the Cal Poly Archeological Field School at Mission San Antonio, and visiting numerous archeological sites throughout the Southwest.